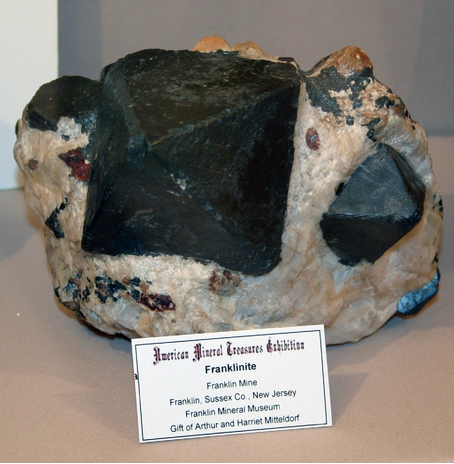 Franklinite: Mineral information, data and localities. 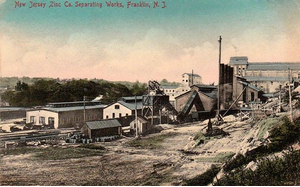 Named in 1819 by Pierre Berthier for the type locality of Franklin Furnace (now Franklin Borough), New Jersey. Silliman (1920) translated Berthier's article: "As the chemical nomenclature cannot in every instance furnish a name, I propose to give it that of The Franklinite, in order to remind us that it was found, for the first time, in a place to which the Americans have given the name of a great man, whose name is equally venerated in Europe as in the new world by all the friends of science an humanity." Benjamin Franklin [January 17, 1706 Massachusetts Bay Colony - April 17, 1790 Philadelphia, Pennsylvania, USA], American statesman, was also the first important USA scientist who investigated electricity and was an inventor of bifocal lenses for eye glasses, the fuel efficient Franklin Stove, lightening rods, the carriage odometer, and the glass harmonica (musical instrument). He was was co-founder of the University of Pennsylvania and the American Philosophical Society as well as serving as Governor of Pennsylvania. He established the model for volunteer fire fighting services. He was the first postmaster of the USA and devised an efficient postal delivery system. He was an important early abolitionist. As a genuine polymath, he was an author and philosopher, newspaper editor, but he is primarily celebrated as a politician and ambassador and credited as a Founding Father of the United States of America. Visit gemdat.org for gemological information about Franklinite. Otahedral crystals common; dodecahedral less common; cubic rare. Willemite 725 photos of Franklinite associated with Willemite on mindat.org. Calcite 580 photos of Franklinite associated with Calcite on mindat.org. Zincite 210 photos of Franklinite associated with Zincite on mindat.org. Hardystonite 106 photos of Franklinite associated with Hardystonite on mindat.org. Rhodonite 68 photos of Franklinite associated with Rhodonite on mindat.org. Andradite 61 photos of Franklinite associated with Andradite on mindat.org. Sphalerite 52 photos of Franklinite associated with Sphalerite on mindat.org. Esperite 48 photos of Franklinite associated with Esperite on mindat.org. Clinohedrite 46 photos of Franklinite associated with Clinohedrite on mindat.org. Tephroite 31 photos of Franklinite associated with Tephroite on mindat.org. Silliman, B. (1820) Analysis of two Zinc Ores from the United States of America. American Journal of Science: v.2(first series): 319-326. Van Horn, F.R. 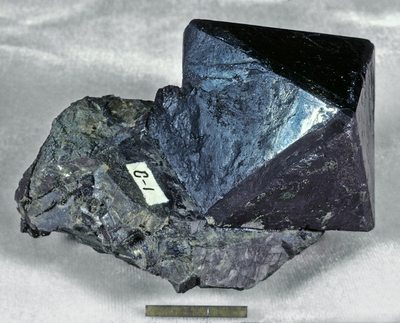 (1928) Large magnetite and franklinite crystals from Franklin Furnace, New Jersey. 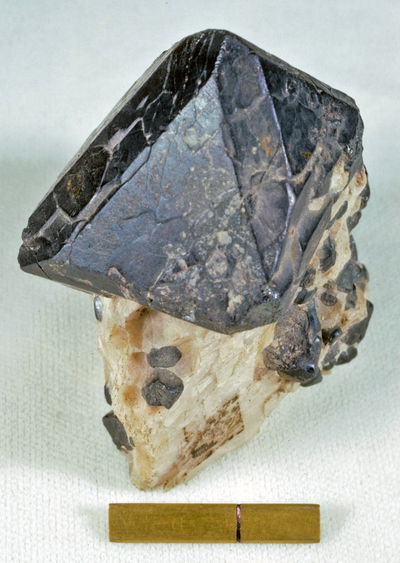 American Mineralogist: 13: 171-173. Palache, C. (1935) The Minerals of Franklin and Sterling Hill, New Jersey, USGS Professional Paper 180: 45. Palache, C., Berman, H., Frondel, C. (1944) The System of Mineralogy of James Dwight Dana and Edward Salisbury Dana Yale University 1837-1892, Volume I: Elements, Sulfides, Sulfosalts, Oxides. John Wiley and Sons, Inc., New York. 7th edition, revised and enlarged: 698-707. Verwey, E.J.W, Heilmann, E.L. (1947) Physical properties and cation arrangement of oxides with spinel structures. Journal of Chemical Physics: 15: 174-180. O'Neill, H.St.C. (1992) Temperature dependence of the cation distribution in zinc ferrite (ZnFe2O4) from powder XRD structural refinements. European Journal of Mineralogy: 4: 571-580. Lucchesi, S., Russo, U., Della Giusta, A. (1999) Cation distribution in natural Zn-spinels: franklinite. European Journal of Mineralogy: 11: 501-511. Moran, E., Blesa, M.C., Medina, M.E., Tornero, J.D., Menendez, N., Amado, U. (2002) Nonstoichiometric spinel ferrites obtained from α-NaFeO2 via molten media reactions. Inorganic Chemistry: 41: 5961-5967. Reichmann, H.J., Jacobsen, S.D., Ballaran, T.B. (2013) Elasticity of franklinite and trends for transition-metal oxide spinels. American Mineralogist: 98: 601-608. 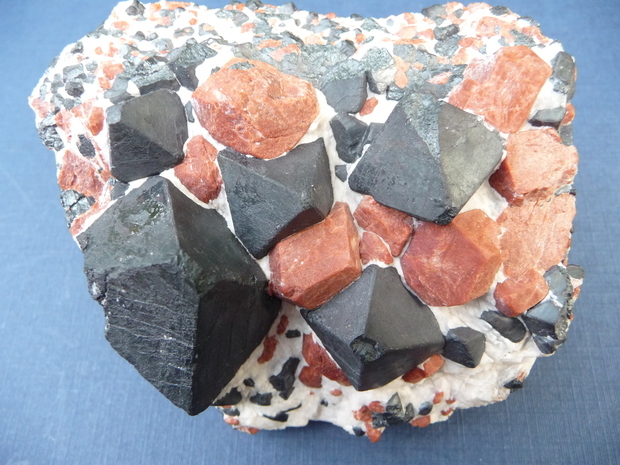 The following Franklinite specimens are currently listed for sale on minfind.com. Kayupova, M. M. (1964) Pyrosmalite from the Dzhumart and Ushkatyn Deposits, Central Kazakhstan. Translated from: Pirosmalit iz mestorozhdeniy Dzhumart i Ushkatyn v Tsentral'nom Kazakhstane. Doklady Akademii Nauk SSSR, 1964, Vol. 159, No.3, pp.560-663. ⓘ Ushkatyn deposits (Ushkatan) ? Frank Dzubeck; Kayupova, M.M. (1965) Doklady of the Academy of Sciences U.S.S.R., Earth Science sections, 163, 97-100. Kayupova, M. M. (1963): Mineralogy of the Dzhumart iron-manganese deposit. Izvestiya Akademii Nauk Kazakhskoi SSR, Seriya Geologicheskaya, 1963 (6), 57-80.; Kayupova, M. M. (1964) Pyrosmalite from the Dzhumart and Ushkatyn Deposits, Central Kazakhstan. Translated from: Pirosmalit iz mestorozhdeniy Dzhumart i Ushkatyn v Tsentral'nom Kazakhstane. Doklady Akademii Nauk SSSR, 1964, Vol. 159, No.3, pp.560-663. Schweiz. mineral. petrogr. Mitt. (1994) 74, 321-328; Jancev, S. (2001): Peculiar antimony-bearing minerals of the spinel group in metamorphic rocks from near Nezilovo village, Macedonia. Geokhimiya, Mineralogiya i Petrologiya 38, 73-78. Zaitsev, A. N. (2010). Nyerereite from calcite carbonatite at the Kerimasi volcano, northern Tanzania. Geology of Ore Deposits, 52(7), 630-640. The Minerals of New York City & Its Environs, New York Mineralogical Club Bull., Vol. 3, No. 1, Manchester, J.G. (1931): 76. USGS Prof Paper 180(Palache, C.)(1930). Van King; Chester S. Lemanski, Jr.
Common knowledge of occurrence. ; Leavens, P. B., Zullo, J., & Verbeek, E. (2009). A complex, genthelvite-bearing skarn from the Passaic pit, Sterling Hill mine, Ogdensburg, New Jersey. Axis, 5, 26.
ⓘ Devine zinc property ?